Members of the gaming industry from all over the world are coming together to help in the wake of last week's disastrous earthquake and tsunami in Japan. In case you've somehow been in a news-less bubble for the past few days, you've probably heard of the devastating Sendai earthquake that rocked Japan on Friday. Between the magnitude 9.0 earthquake and the subsequent tsunami that ravaged the island country's coasts, many expect the death toll to reach into the tens of thousands. EVE Online developer CCP is taking donations of its in-game time-currency PLEX (it's complicated), which will be converted into real-world money and donated to the Red Cross as part of its PLEX for Good drive. EVE Online players, now's your chance to help. Naturally, some of the largest Japanese publishers have contributed to home-grown relief efforts as well. Andriasang has a roundup of some of the major ones: Sega Sammy donated 200 million yen ($2.45 million) from its own coffers. Nintendo and Sony Group (not just the gaming division) both donated 300 million yen ($3.67 million) apiece, and Namco Bandai contributed 100 million ($1.22 million). There are also plenty of charity auctions to be found if you know where to look. Game Informer's Meagan Marie has one of the most appealing: A red original-series Nintendo DS signed by luminaries like the legendary Shigeru Miyamoto, composer Koji Kondo, Zelda director Eiji Aonuma, and more. Bidding for the fully-functional DS is currently at $215 on eBay, but that number can only go up from here. If you want to own a piece of gaming history and support a truly great cause, that's your chance. For everyone else, you can go through places like the Red Cross. If you know of cool game-related (or not!) efforts to raise funds for relief in the wake of this tragedy, please feel free to go ahead and list them in the comment thread. They need all the relief they can get. From what I heard on the news the cost of damages ranges in the 150 billion dollars. Let alone all the lives lost. Shows how big part Japan plays in the gaming/internet culture. Two nuclear plants that still aren't back in the green and christ knows how many square miles of agricultural land destroyed. It will all pale in comparison to the day that Tokyo is utterly annihilated by the three-way fault it sits on top of. OT: I know Japan's still considered the gamers mecca, but its good nevertheless to see people putting their efforts into helping someone when they are down.. Normally I'm extremely skeptical of the direction of human culture and where we're headed, but when something like this happens, I can't help but just be completely dumbfounded by how quickly we respond to the situation and how much people tend to come together in times like this. OneBookShelf is collecting donations to Red Cross through websites like DriveThruRPG. They've put together Donor Bundles in the past for similar disasters, but having only recently put out a ChristChurch Bundle, I don't expect we'll see one for Japan. Shouldn't stop you from donating out of a sense of goodwill, though! Hey, do you guys mind if I use this article on youtube? I would like to spread the word, however little that I can. Actually I've been thinking that with all the disasters recently, it probably won't be too long before the fault line under California goes off too. It's quite a relief to hear such tales of kindness. I'm more worried about Cascadia. A third reactor has gone off. Truthfully the possibility of that happening seems to be incredibly remote. I'm not too far away from the "Millstone" nuclear power plants down here in Connecticut, not to mention EB where they make Nuclear subs. I know a little bit about power plants and reactors, the odds of having a Chernobyl-like incident are pretty much non-existant given that it would require a "perfect storm" of events starting with truely awful construction, the Russians kind of brought it on themselves. from a lot of what I've read. 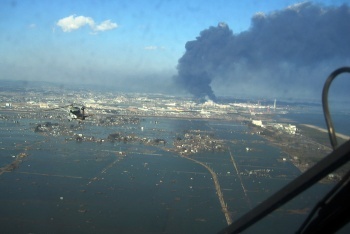 People panic whenever something nuclear gets involved, but I think Japan's plants were developed well enough where they are unlikely to melt down. Radiation leaks are plenty bad, and seep in more the longer they go unfixed, but nothing like what I think people are afraid of, and that's the worst I can see this getting. Slim comfort to people actually there though I suppose. I'm sure Japan has plenty of experts on nuclear power for those plants as well, and if they don't due to the scale of the disaster, I'm sure the US Navy at least has some people that will get involved if they aren't already. Eeeesh. I understand that due to spatial constraints and the amount of energy Japan requires there's not many options as far as energy sources go. But nuclear power is always risky, and this time it looks as though we're in for a worldwide reminder as to why it's been dying out as a reasonable large energy source.